I finally watched this 3 episodes long TV special from 1992 which is an adaption of Shungiku Uchida‘s same-named horror manga. The story itself isn’t that remarkable even if Uchida is a talented mangaka/writer and famously associated with the avant-garde manga magazine “Garo“. Howsoever, “Noroi no Onepiece” has a very traditional approach to horror as it wasn’t serialized in latter anthology, but in Asahi Sonorama‘s shoujo magazine “Halloween“. The three short stories are all about a cursed one-piece dress that brings their owner doom, so nothing out of this world. The true reason why I checked it out was the fact that it’s Kyoto Animation‘s first significant work, or more precisely a production by order of Shin-ei Douga and TBS. Latter is a close business partner of KyoAni to this day, and Shin-ei Douga was not only one of their most frequent clients for subcontract work (e.g. on Doraemon, Ume hoshi denka movie and more recently Haré+Guu), but also had considerable influence on their approach. Shin-ei Douga – a studio famous for anime like Doraemon and Shin-chan – still carries on the legacy of the pivotal Toei Douga era (late 1950’s and 1960’s) and has been nurturing many talents over the years. Many anime fans may not be familiar with Toei Douga, so let me explain it with a few words since it’s something very important in anime’s history. The Toei Douga “philosophy” was a trend in Japanese animation to stay closer to Disney’s principles, which means – as opposed to Tezuka‘s limited and over-expressionistic animation – to breath life into the characters through fluid movements and more literal acting. As we all know, it’s Tezuka‘s (cheap) way of producing animation that gained acceptance in the end since it allowed for economic mass-production of animated TV series, but Toei Douga‘s tradition still lives on in certain studios and artists, particularly in Studio Ghibli (Miyazaki himself started out at Toei Douga) and the aforementioned Studio Shin-ei Douga. I see a lot of the Toei Douga spirit in KyoAni‘s works as they always try to make everything move as much as possible and invest much time into establishing character-based movement sensibilities. Both Noriyuki Kitanohara and Hiroyuki Takahashi – who are lecturers at KyoAni‘s animation school – were frequently involved with Shin-ei Douga at the beginning of their careers, which certainly influenced the animators they trained over the years. Yoshiji Kigami, one of the most respected persons inside KyoAni and member of the board of directors, started out at Shin-ei Douga and was probably instrumental in establishing a similiar philosophy at Kyoto Animation. And with Kigami we come back to “Noroi no Onepiece” since he was its director and animation supervisor as well as character designer. The storyboard work was shared with Shin-ei Douga‘s female director Kyoung Park. 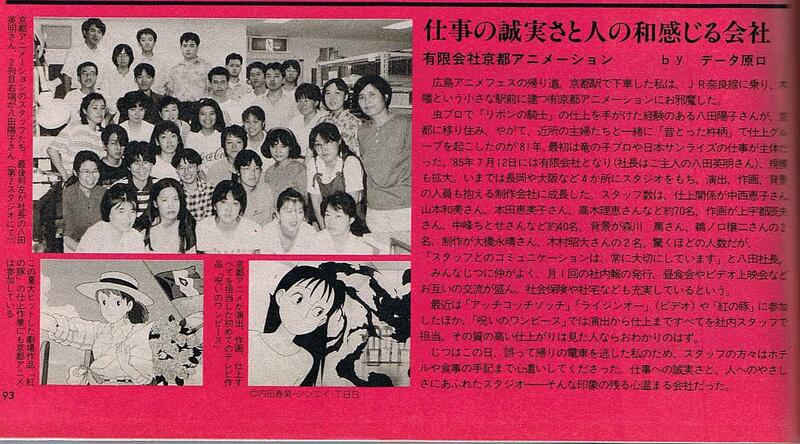 “Noroi no Onepiece” brought – for the first time – Kyoto Animation to the attention of anime fans due to the high quality work they are famous for up to the present day; the 1992 Animage article at the top of this post introduced KyoAni and was probably one of the first articles ever about them, including a group photo. After his supervision debut, Yoshiji Kigami came regularly back to directing, most notably are his personal work “Munto” – which happens to be KyoAni‘s first original anime – and the cockroach episode of “Shuukan! Story Land”. Not to forget the great opening of the 9th “Jikkyō Powerful Pro Yakyū” game for which he served as the director, storyboarder and animation supervisor. Thank you so much for writing such a good blog. I’m a profesional animator and it’s not easy to find such a profesional opinion about anime and I really apreciate it! I have a collection of Uchida’s works somewhere… wonderful, rough stuff, ripe for adaptation into animation, though most of it lacking in the fantastical elements of this short. The good old days of the one shot oav, maybe we will see them again when the industry learns to exploit the market of the net. Or not. @Abel: Thanks for the praise! @gingersoll: I’d love to see more of Uchida’s works (or other “Garo” manga at that) adapted into animation since it’s so hard to get your hands on that stuff. Can’t see that happen, though. At least not without some fundamental changes of the market (like the one you pointed out). And even then… can’t imagine that someone would put up that old stuff. Anyway, it would be great if the OVA medium (or ONA) were to get more attention as a vessel for more experimental and avant-garde anime again, like in the 80s and early 90s.